We’re constantly bombarded with images and information portraying the greatness of others: Giza’s pyramids, or the Aztec temples, the Taj Mahal, and the Great Wall of China. It seems to me that sometimes, the information that we receive and the impression that we are given seems to want to forget the majesty of our own island nation. Our country was inhabited at the time of Egyptian rule and Myan civilisation. People seem to either forget this, or tell us that primitive cannibals inhabited it. WRONG! People will tell us that the standing stones found in Britain (and scattered across Europe), were ancient temples for ritualistic human sacrifice. This may in fact be true, but what people fail to mention is the complexity of these stones. • Firstly, it must have been a huge task involving precise tools. Showing us that Neolithic man actually had a good understanding of making and using tools. • Secondly, the way in which they are built and spaced out, show us that Neolithic man had adopted a form of scientific measurement, commonly called the Megalithic yard. A man named Professor Alexander Thom, an engineer, discovered that the standing stones may in fact have been ‘a map of the heavens’. They are aligned due north south, which means that the builders had a sound knowledge of astronomy. Professor Thom also discovered that the basis upon which the stones were built were triangles. Within stone circles, there were invisible, measured triangles; commonly known as Pythagorean triangles (check your GCSE maths book!). Were the builders of Stonehenge really that primitive? 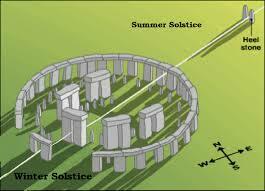 Our ancestors had an advanced knowledge of astronomy. And so we ask the question: Who built the standing stones? The answer that you will come up with is this: Great engineers, with high intelligence levels and an excellent knowledge of astronomy. Skilled workers with advanced tools and great determination. Our native British ancestors. This article raises some very interesting questions to which science has not supplied totally convincing answers. How did the builders of Stonehenge get the large blocks of stone from South Wales to Wiltshire and what was the purpose of Silbury Hill? The more you look into these questions the more questions arise. 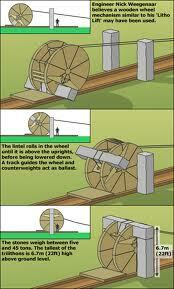 Prehistoric engineers? Where did they come from? Who taught them? We’re not sure how they did it but here is one theory. This entry was posted in Ancient technology. Bookmark the permalink. Yes, the megalithic period around the globe leaves scientists scratching their heads because they are not able in this day to duplicate many of these structures. 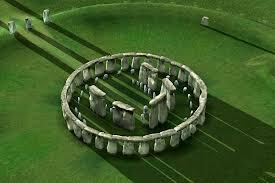 It is amazing how the site of Stonehenge is aligned with so many other sites around the globe. This I don’t believe could of happened without precision aerial surveying which of course primitive civilizations did not have at the time. I think where people get derailed with regard to modern archaeology and plausible explanations for how sites like stonehenge were created can be attributed to the politics of history. When we factor in that real history doesn’t match up with the politically correct history that we are taught in school then you will be able to disregard the establishments thinking and begin to accept that the text writers don’t want the public to know real history. I like to think that it was built by the Giants or Fallen Angels who shacked up with human females. Remember Goliath in the Bible! God wiped their progeny all out in the Great Flood whilst promising us he would not let such a flood happen again. – you can’t slide a knife between the stone blocks even today. Only that sort of Alien has the knowledge and the Druids etc got their knowledge from Demons which is why they carried out human sacrifice. It still goes on today in increasing amounts amongst the elite Satanists who kidnap/kill babies/children in offering to Lucifer! It certainly does exist today with all the above taking place. Please don’t be under any illusion that demons are not at work today. As pastors we see and deal with the aftermath of the occult. We recently prayed with a lady who thankfully escaped the clutches of her sate sit family. She was repeatedly raped in rituals and gave birth to two babies which were taken away at birth for sacrifice. Fits in the time period when Giants roamed the Earth – heh heh. The compound character known as the triple tau is one of the Royal Arch’s emblems. A triple tau is literally “three Tau’s,” the tau being the nineteenth letter in the Greek Alphabet. The triple tau of Royal Arch Masonry consists of 3 Ts linked in the centre joined at their base. This mystical character can be signified in a few different ways. First, the names Hiram of Tyre and Hiram Abif appear in the Phoenican language with the same letters “H” and “T” as they do in English. Therefore, the Triple Tau takes on the interpretation of the initial letters in Hiram Abif’s name. Second, it signifies also T. H., Templum Hierosolym, the Temple of Jerusalem, and when used as the Royal Arch symbol, some jurisdictions teach that the wearer acknowledges himself a servant of God. Thirdly, Christians in Greek or Roman influence anciently used a tau cross. The basis of a triple tau in early church history would mean the trinity of father, son, and holy spirit. A belief in the triune nature of godhead is common to many faiths and religions. A triangle is a simple shape in geometry that has taken on great spiritual significance and symbolism. The equilateral triangle was revered by ancient nations as containing the greatest and most abstruse mysteries, and as a symbol of God, denoting a triad of intelligence, a triad of deity, a triune God. The equilateral triangle shows equality with its three angles of the same degrees. In one way, it best represents deity by its equality or perfection in design and proportion. Ancient Greeks knew how to build these geared computers in 100 BC to measure moon phase. The BBC prog on how they reverse engineered and learned how it works is brilliant! Would we have developed a Taoist or Buddhist type of philosophy in Britain if not for mono-theism?